Awnings and canopies allow homeowners to enjoy the wonders of their garden during the height of the summer, by providing rest bite from the sun with shaded areas. You can utilise this space with a garden table and chairs to give yourself a fantastic area to relax and the awning or canopy can be used as and when it’s needed. The retractable awning does exactly what it says on the tin. It’s able to retract from view when not in use and opens out when you want to create a shaded area. This is all your choice and controls allow you to adjust how little or far the awning opens out. 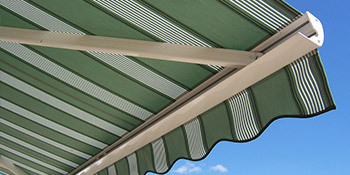 Of course, the most popular application of an awning is for shade purposes in the garden or patio area. But with an awning you can suit any purpose and they can be installed anywhere with special brackets. There has been an increase in popularity for awnings recently because of the awareness of the rise in skin cancer. Even the simplistic design allows homeowners to benefit from a shaded area where they can still enjoy the beauty of their garden. If you want to make the most of your garden in the summer and throughout the year, but don’t want to feel too much heat and exposure to the sun, an awning or canopy could be right for your home. For up to four free quotes from local, vetted professionals in your area simply complete our quick form and we’ll match your criteria to trusted, reputable companies. Project: Installation of 4.00mtr manual awning. No p robs with installation site access etc. Project: I have a 3 metre full cassette patio awning, which I require to be installed on the brickwork of my extension. Can you please supply quotes for the job. Project: I'm looking for an awning to be fixed above my dining room window and extend out over my patio area to provide shade from the sun. many thanks, Caron Bromley.